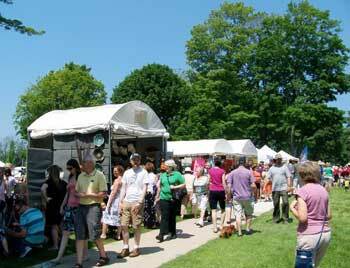 Downtown Ludington hosts several arts and crafts fairs throughout the year. 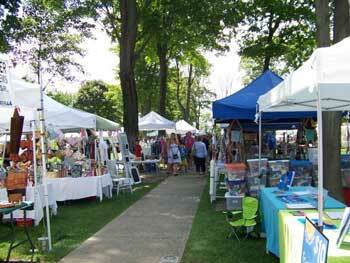 The summer fairs are especially popular, being held outdoors in Rotary Park (formerly City Park) at 400-500 West Ludington Avenue. 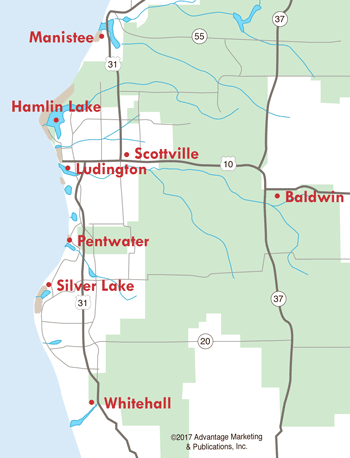 It's the perfect location to browse the arts and crafts by local vendors, and then walk just a short distance either to beautiful Stearns Park to enjoy the Lake Michigan shoreline, or walk a short distance the opposite way to browse many friendly Ludington stores and experience great restaurants. The 2019 West Shore Art Fair will be held Saturday, July 6 and Sunday, July 7, 2019. This year, marks the 51st anniversary of this prestigious fine art fair. The Art Fair is sponsored by the Ludington Area Center for the Arts and is a juried fine arts and crafts show...which means a more stringent criteria is used and only the highest-quality artists are admitted. In 2018, over 100 juried artists were accepted to display paintings, photography, jewelry, clay, glass, fiber and wood, and many other varieties of fine art. In addition to the exhibits, the fair features live musical performances, food stations and a children's activity area and location children can purchase art for just $5. The Art Fair is open Saturday 10am-5pm and Sunday 10am-4pm. The Gold Coast Artisan Fair, sponsored by the Ludington & Scottville Area Chamber of Commerce, will be held August 10-11, 2019 and is open Saturday 10am-5pm, Sunday 10am-4pm. Vendors from across the state and beyond sell a variety of wonderful handmade items, jewelry, photographs, paintings, and more. Shop for gift items, or pick up something unique for your home. There's something for everyone, including good things to eat! Application information, click here.